Young women in particular reported hostile experiences online, according to Maeve Duggan, a research analyst at Pew and the main author of the report. I talked to Duggan recently in an interview for PBS MediaShift. The survey shows that in some ways, how people react on the Internet mirrors how people react to each other in the physical world. People are affected by online harassment at the frequency in which they integrate their online and offline lives. This has partly to do with age and whether they’re using the Internet for personal or professional purposes. But the responses gathered also show the online environment has its own complexities, with the anonymity of the Internet and evolving definitions of “online harassment” playing a role in how people perceive and react to situations that may arise. Among the survey’s key findings is that online harassment generally falls into two overlapping categories. One category encompasses annoyances like name-calling or attempts at embarrassment. These are everyday experiences, and the people who experience them are generally indifferent to them because they’re so common. More than half of survey responders — 55 percent — said they have experienced this kind of harassment only. The other category of harassment, however, involves more intense experiences and affects a smaller segment of the population. These experiences include stalking, sexual harassment, being the target of physical threats and other harassments lasting over a period of time. Forty-five percent of respondents reported having experienced this “more severe” kind of harassment. Young women aged 18 to 24 were most vulnerable to experiencing this severe harassment. Twenty-six percent of women in this age bracket reported being stalked online and 25 percent reported having experienced online sexual harassment. These findings were not just stark in comparison to men, but also to women just a few years older, aged 25 to 29. Social media was the most frequently cited online environment people experienced harassment, with 66 percent of respondents saying they experienced their most recent incident of harassment on a social networking site or app. Website comments sections and online gaming platforms were also places harassment took place, though at lower rates. When it came to interpreting how welcoming these platforms were for men and women, however, gaming platforms stood out. Forty-four percent of respondents said they believed online games were more welcoming toward men, compared to only three percent who said the same for women. “As someone who plays a lot of video games, playing online is kind of like the Wild West,” Mashable’s Games reporter Chelsea Stark told PBS MediaShift. Stark said that although there are more women on gaming platforms now than ever, men still outnumber women in highly competitive games (though there are no hard statistics to back this). It’s not that women may be overly sensitive to interactions online — in fact, the gaming environment can be quite anonymous because people can hide behind their user names, Stark said. It’s that the climate itself can be pretty harsh — just like the Wild West. “There are plenty of players on games that will find any reason that you might be different and try to use that to trash-talk,” Stark said. It’s perhaps the nature of the Internet that allows for people to react this way, according to the Pew survey findings. Nearly all respondents — 92 percent — said that online environments enabled people to be more critical of each other compared to how they would interact offline. More than half (63 percent) also felt they could be more anonymous online. At the same time that the trend of easy criticism came from the survey results, however, so did the tendency to offer support. Sixty-eight percent of respondents said the Internet enabled them to be more supportive. 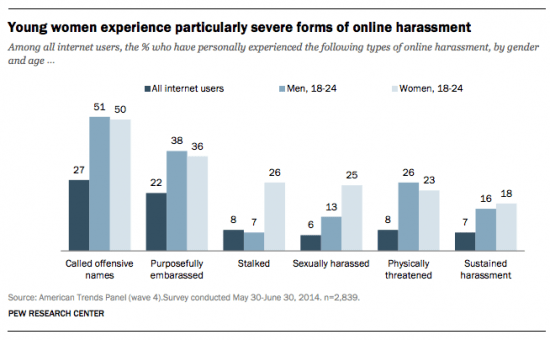 WHAT DOES ‘ONLINE HARASSMENT’ MEAN ANYWAY? The Pew survey findings showed the gamut of reactions that people had to harassment online — from brushing off personal experiences, to remaining apathetic at a friend’s situation, to being personally and emotionally affected by an incident for a considerable amount of time. Much of these reactions stemmed from prior incidents of severe versus non-severe harassment. A person was much more likely to take a specific situation seriously if he or she had encountered a serious situation before, for example. But the fact that there is currently no concrete definition for “online harassment” may also contribute to the varied interpretations and therefore, reactions. And there isn’t a formal agreement on who should monitor this behavior either. 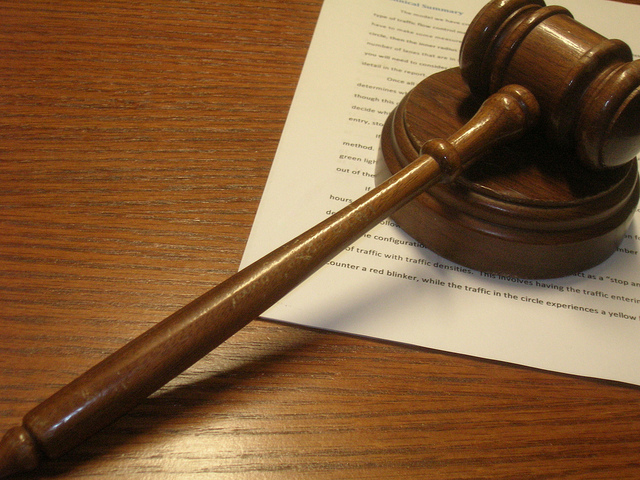 “The law of the land is that websites aren’t responsible for what people post on their sites, in terms of interacting with the website and trying to use it as a resource,” Duggan told PBS MediaShift. Danielle Citron, author of the book “Hate Crimes in Cyberspace,” said that there are “evolving definitions of online harassment” that are borrowed from criminal law — one being a repeated offense targeted at an individual that would cause “substantial emotional distress and/or the fear of physical harm.” But the definition is not enough by itself. “The key is understanding how it is accomplished,” Citron told PBS MediaShift in an email interview. You can read the details of the complete Pew Research Survey on online harassment here. This piece was originally published on October 22, 2014, on PBS MediaShift. Next post:What Can Instagram Tell Us About Social Upheaval in Ukraine?